Set amid the moist maritime climate of the Irish Sea, Ireland is better known for its verdant grasses than its diversity of flowers. However, a variety of native and introduced flower species are traditionally found there, thriving in the moist, cool climate that gives the island its characteristic shade of green. Known for their beauty and ease of cultivation, the traditional flowers of Ireland provide seasonal color to gardens and roadsides across the country. Native to Ireland, foxglove (Digitalis purpurea), also known as lus mór, can be found in woodland drifts and garden plantings around the country. Known for its tall spikes of nodding tubular flowers, foxglove comes in shades of white, pink and purple with light speckling along its flowers' throats. 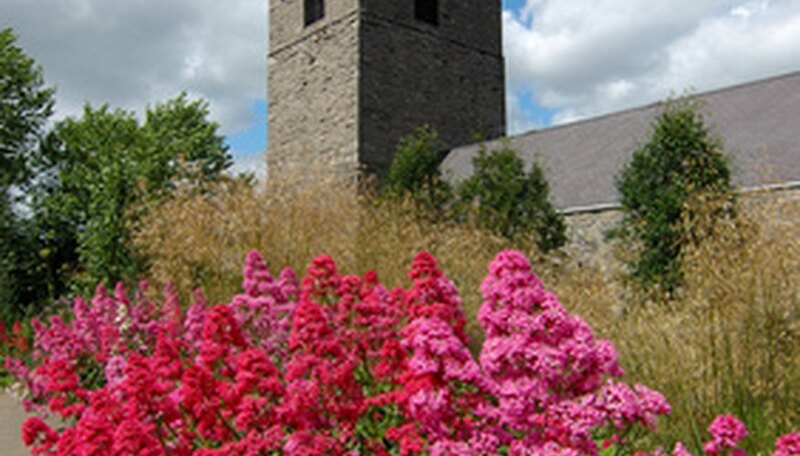 Among the oldest and most traditional flowers in Ireland, the flowers are often referred to as "dead man's thimbles" due to their shape and toxicity; they can cause a heart attack if ingested. Biennial in growth, foxgloves live for two years, blooming during the second. Commonly called red valerian or slán iomaire in Ireland, Jupiter's beard (Centranthus ruber) is a naturalized Mediterranean species traditionally grown in gardens around the country. Adaptable to a wide range of conditions, Jupiter's beard is found virtually everywhere in Ireland, from simple gardens to along roadways. Blooming from June until September, red valerian is known for its showy reddish-pink flower heads and tall, shrubby growth habit, and can reach two feet in height under ideal conditions. The most common wild rose in Ireland, dog rose (Rosa canina) is a perennial rambling shrub found throughout much of the country. Called feirdhris in the Irish language, dog rose has many common names, including witches' briar, hip rose and sweet briar. Known for its prickly canes and delicate, five-petaled flowers, dog rose blooms throughout much of the summer, producing round reddish fruits in early autumn which are edible and high in vitamin C. Used to create hedgerows for centuries, dog rose is now frequently cultivated in gardens across Ireland, trained to climb trellises or used to mark the boundaries of property. Called coirean mara in the Irish language, sea campion (Silene uniflora) occurs in coastal areas around Ireland, particularly amid rocky outcroppings and cliff-faces. Small and delicate, sea campion reaches a mere 7 inches in height due to the strong winds and salty soil present in its native habitat. Known for its unusual flowers, it bears abundant grayish-green foliage throughout the year, sending up snow-white blooms with speckled, bladder-like protrusions from June until August.